We were tired of being cold. We were tired of wearing stocking caps in the house and warm, fuzzy pants at night. We were tired of drizzly, rainy days and living without central heat when it's 50 degrees Fahrenheit outside. Were we really complaining about a little rain and a low temperature of 50? Yes, we were. It was time to go to lower elevations and enjoy the sunny, warm weather that one associates with Mexico. We were ready to leave San Cristobal de las Casas. 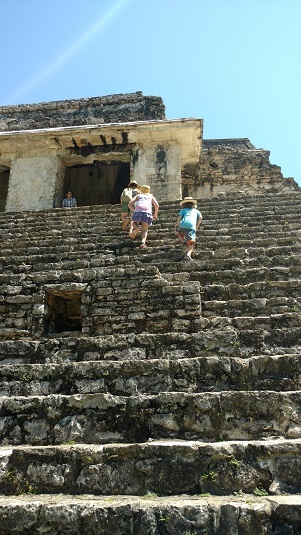 We had three months left on our visas so we decided to use that time exploring the Yucatan Peninsula. 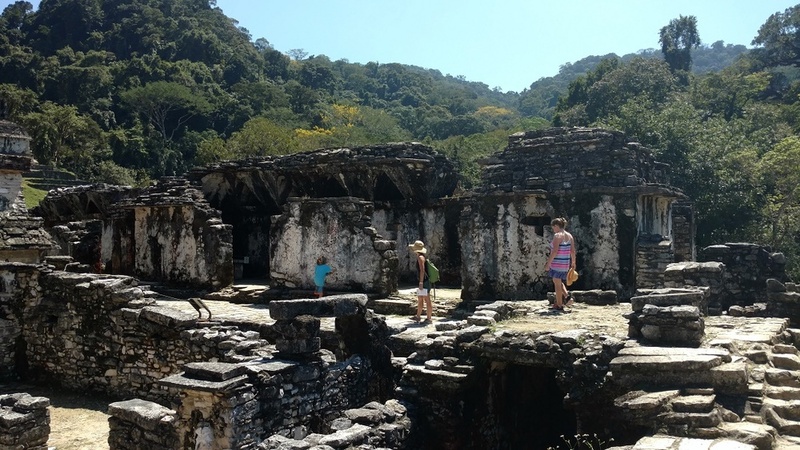 The first stop was Palenque, a small town best known for the local ruins and the national park that draw tourists. But, first we had to get there. This was tricky. Four days before leaving San Cristobal, we spoke with other travelers that attempted the 4-hour route from San Cristobal to Palenque that day. After driving for 2+ hours, they encountered stopped traffic that rarely moved forward. They ended up returning to San Cristobal that evening. A whole day of travel wasted. MORE BACKGROUND: A couple of years ago, bandits were known for carjacking and bus-jacking vehicles on this road. There was one bad incident that no one likes to discuss where several people died. More recently, locals have been using the road to stop and ask for "donations" for their towns and harass the cars if they are denied. It's also not uncommon for there to be political protests which close the road until the government gives attention to the request of those who feel disenfranchised. We were told by several people that unless we wanted to leave around 4 am, we should expect delays, and maybe even a return trip to San Cristobal. While this kind of danger is not what we've come to expect in Mexico, or even most of Central America, we still do our research and talk with locals before any long drives. 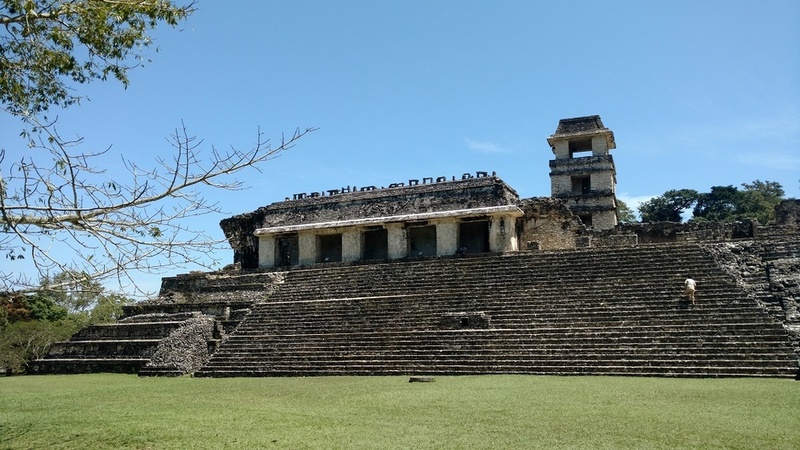 It was recommended that we drive to Palenque the long way around, doubling the length (in distance but likely not in duration) of that day's drive. It was an easy decision. Bonus - The long route took us past two Starbucks. The long way was uneventful and almost entirely on toll roads (which are really nice highways in Mexico). We arrived in Palenque just before dark, and Ken wasn't feeling well. We checked into our hotel with a pool that was out-of-service. We unpacked the car, made the short walk to the center of town and ate a nice dinner. We got to bed early as we knew there was a lot to see and we planned to stay two full days. 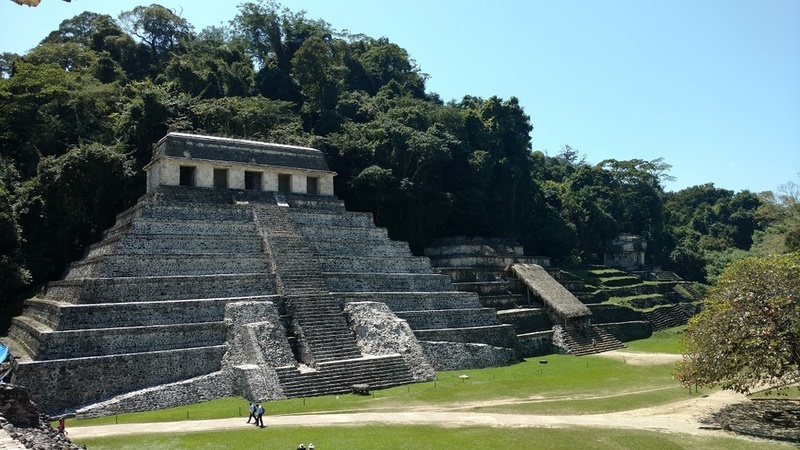 The Ruins of Palenque offered much of what we've seen at other ruins in southern Mexico and northern Central America. However, the scale of Palenque was quite impressive. Only 90% of the ruins are uncovered. As one looks around at all the hills, it's likely there's a Mayan structure underneath each one. It was also hot, and the kids were complaining. Then, Tag's little toe was bit by an ant. After an hour under the scorching sun and an itchy foot, he was in full melt-down. It was time to leave. 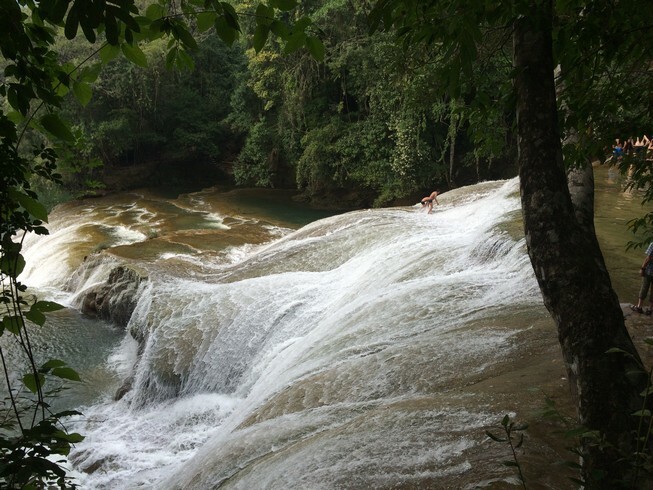 Aluxes Ecoparque was the highlight of Palenque. This is an animal sanctuary, and they return animals to the wild whenever possible. 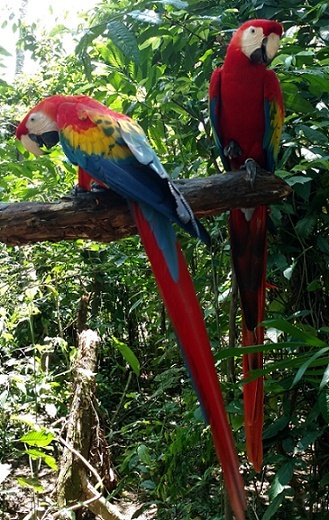 Aluxes is a not-for-profit, NGO that raises money by sharing the animals with the public. There were only a few others in the park, so we felt that we had the animals to ourselves. 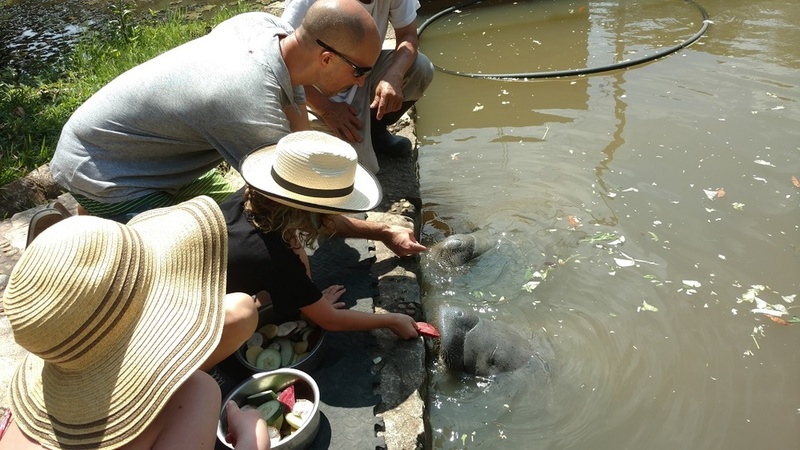 We started off by feeding the manatees, an experience that none of us will ever forget. After the manatees, we moved on to the big tortoise. Ela loved the tortoise. Tag humored us by posing for a pic. Tag LOVED these signs. He'd run ahead and yell back whether the animal was a carnivore or fructivore. The pictures representing the diet, habitat, habits and incubation, as well as the map, all appealed to him. All of the animals were in nice, spacious habitats, appeared clean and well-cared for and had great energy. If we ever drive through Palenque again, we'll definitely be stopping at Aluxes. Even with their stinky breath, I'd love to feed the manatees again. After feeding manatees and feeding ourselves, we ventured out in search of one of the amazing waterfalls in the area. 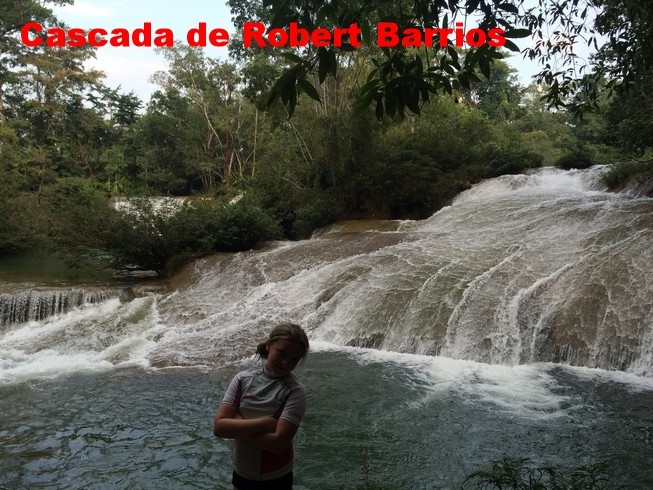 After reading several Trip Advisor reviews, we chose Cascada de Robert Barrios because it wasn't likely to be overrun with tourists and it wasn't too far away. I don't think we could have made a bad choice though. 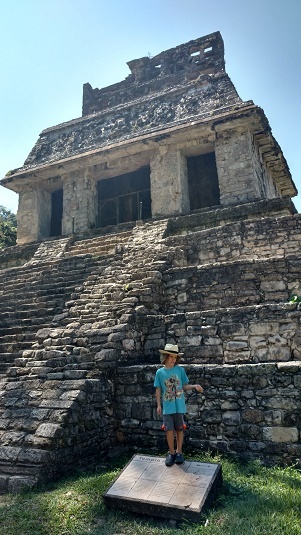 Palenque was fantastic, and it was worth a short stop. But, we were already looking forward to the next stop, a colonial town that once walled itself in to protect from pirates!